Days of Our Lives spoilers reveal Marlena Evans (Deidre Hall) wakes up from her coma and reveals some shocking news about Sami Brady (Alison Sweeney) and her wedding day. Hattie Adams impersonated Marlena Evans while she was in her coma, which caused horrific situations for her friends and family as they dealt with this “new” Marlena. However, the news that the “real” Marlena reveals bring even more questions to the forefront. Marlena Evans comes out of her coma up to find herself in an abandoned part of the hospital. Obviously, she’s confused and has some questions. However, she’s not alone for long. Kristen DiMera (Stacy Haiduk) figured out that the doppelganger was really Hattie and tracked down the real Marlena with plans to finish her revenge plan. With a gun in one hand, Kristen taunts her. However, Kristen can’t do anything when Roman Brady (Josh Taylor) and Kayla Brady (Mary Beth Evans) show up. As we previously reported, this results in a struggle between Roman and Kristen as he tries to get the gun away from her. This ultimately leads to an accidental gunshot. While the gunshot doesn’t hit anyone, it does hit a fan that falls on Roman, which gives Kristen the opportunity to harm Marlena. Before she can, Kayla grabs the gun. Kristen flees. John Black (Drake Hogestyn) reunites with his love and fills her in on why she’s hidden and how Hattie has been impersonating her. He also informs her of how Sami shot her at the wedding, which results in Marlena revealing what she remembers from the wedding. During these flashbacks, we learn that Sami Brady didn’t shoot her at all. Marlena Evans reveals Sami Brady didn’t shoot her at her wedding. Instead, Evans saw a hidden figure behind some bushes who was holding a gun. She reveals that Sami isn’t the one who shot her. She believes the hidden figure was the one who did. Sami finds out that “Marlena” isn’t actually her mother at all and goes on a search for her mom. During this search, she runs into Eli Grant (Lamon Archey), who arrests her because he says that she is violating the terms of her release. However, Sami soon is vindicated on DOOL. Now, they have Marlena’s memories of what happened at her wedding, which puts Sami in the clear. Ballistic tests are also done, which finds that Sami isn’t the shooter. Finally, Sami is believed. She has told everyone that she didn’t think she actually pulled the trigger. However, she was drugged at the time, so many explained this away and said she wasn’t in total control of her actions. Days of Our Lives Spoilers: Who Shot Marlena? Now that it has been proven that Sami didn’t really shoot her mother, the mystery of who really pulled the trigger needs to be discovered. Kristen is obviously the first choice, but it can’t be her. She was in everyone’s eyesight and would’ve been seen if she was the one who shot Marlena. So, who did? Is it someone who’s already in Salem? Or someone who came back and hasn’t been seen in town for a while? Does this person work with Kristen? Or were they just in the right place at the right time and wanted to bring Marlena, or Sami, a world of pain? Fall in Salem is going to bring loads of drama if the fall promo video NBC released is any indication. Will we learn who really shot Marlena this fall? Or will this mystery turn into a long journey, heading into winter and maybe even into next year? 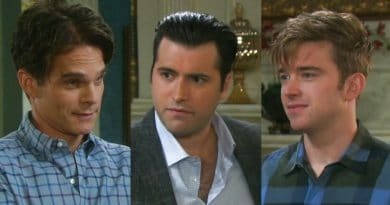 Make sure to come back to Soap Dirt daily for all your latest Days of Our Lives spoilers and news.